The Arts and Humanities department is hosting an art exhibit called “Art With Purpose” in the Visual and Performance Arts Center March 22 through April 12, said Cultural Programs Director Lemuel Bardeguez. Bardeguez said artists Eric Humphries’ and Hugh Meade’s work will be displayed in the VPAC art gallery. “This is going to be an interesting show because we have brought in two artists that compliment each other very well,” Bardeguez said. 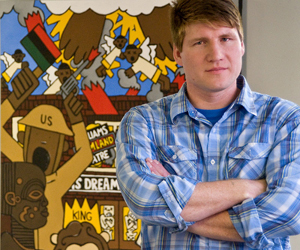 Humphries, an artist-historian, specializes in paintings of historical tragedies or atrocities. “He takes events that have happened in history; oftentimes events that were very painful for humanity and then brings them to life through his eyes,” Bardeguez said. “Some of the things that we will have in the exhibit are shoes that are kind of like what Lady Gaga would wear, (and) special tables that he made and manufactured or he collaborated with another artist with to paint,” Bardeguez said. Bardeguez said this is one of three shows scheduled each year. “We have three shows per year — one in the fall, one in the spring and one in the summer,” he said. For more information, e-mail lbardeguez@occc.edu or visit www.occc.edu/cp/currentgallery.html .